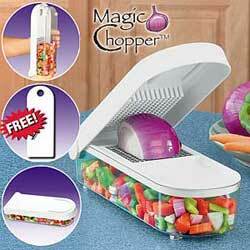 Magic ChopperTM is the safest way to chop or dice! One quick motion processes an vegetable with ease! Insert the chopping blade and press down. Produce is cut into uniform pieces, and collected in the storage container.